In normal vision, the cornea (the front of the eye) and lens make sure light focuses right on the retina (the light-sensitive layer at the back of your eye). If you have myopia, your cornea is curved too much, or your eyeball is too long. 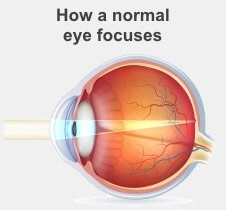 This means your focus falls in front of the retina, instead of right on the retina. When the image focuses in front of the retina, the image on the back of your eye is not as sharp as it should be. Things get more blurred the further away they are. People with uncorrected myopia will often frown and squint as they try to see better, and this may cause headaches. Short-sighted children often hold books very close to read or may sit right in front of the television. The size and shape of your eyeballs are the main things affecting how well focused your vision is. Because your eyeballs keep growing (and so getting longer) until you are about 25, you can become more short-sighted with age. The part of your brain responsible for vision stops developing any further when you are about 7 or 8, but your eyes continue growing with the rest of your body. We can't prevent myopia or reduce it once you have it. Myopia usually gets worse during childhood and the teens then levels off in the mid-20s. People whose jobs involve a lot of close work, such as reading, can develop myopia as adults and it can continue getting worse well into their working life. Eyes with slight to mild myopia are generally healthy, but high levels of myopia (over 6 or 7 dioptres) are associated with an increased risk of retinal detachments, and in older age with glaucoma, cataracts, and retinal degeneration. If poor vision stops you from doing things you enjoy and makes it difficult to see things at a distance you should see your optometrist for an eye examination. It's best to have regular eye exams to make sure your eyes are healthy and you can see clearly and comfortably. Have an eye examination every two years after the age of 40, unless your optometrist or ophthalmologist suggests otherwise. After 65 you may have them more often, so your optician can diagnose and treat any sight-threatening conditions, such as glaucoma and age-related macular degeneration (ARMD) as soon as possible. On the next page: How is myopia treated?